This engaging new series of leveled biographies brings history to life one dramatic story at a time. By focusing on poignant moments as well as public triumphs, Amazing Americans makes paragons of American history feel accessible and real. Thurgood Marshall grew up with Jim Crow laws. These laws forced black people to drink from different water fountains than white people, go to separate schools, and ride at the back of the bus. 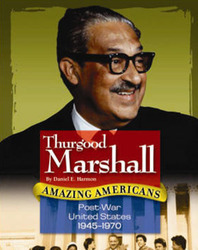 Thurgood became known as Mr. Civil Rights for his legal battles as a lawyer for the National Association for the Advancement of Colored People (NAACP). His appointment to the Supreme Court allowed him to be a stronger voice for civil rights for all Americans.